This mirror was hanging in the Majestic Hotel in Durban, South Africa until the late 1970s, when the hotel was demolished and the mirror was presented to one of the hotel's customers. At the lower centre of the mirror are the words 'Royal Irish Distilleries Belfast' and at the lower right is the name of the manufacturer 'W.W. Cleland, Ltd. Belfast'. It is 37 inches wide by 29 inches high, and weighs 14 kg. 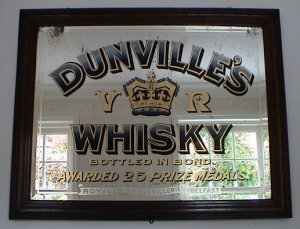 There is a photograph of another Dunville's Whisky mirror on the page of Dunville's Whisky Collectables. This print depicts a group of animals at a table and dressed in hunting tunic drinking a toast to a lion at the head of the table. On the table there are five bottles of Dunville's VR Old Irish Whisky. 'Ye SCRATCH HUNT CLUB' is written on the plaque on the wall, 'And so say all of us' is the caption below the print, and 'DUNVILLE & CO LTD.' is engraved on the frame below the print. In the lower right corner of the print is the signature 'Walter Drayton'. The frame is 102 cm (40") wide by 73 cm (28½") high and the print is 79 cm (31") wide by 50 cm (19½") high. The photograph of this print was provided by Sabine Zurmuehlen. Please let us know if you have seen any other copies of this print, or any similar prints, or if you are able to give us any more information about this print. 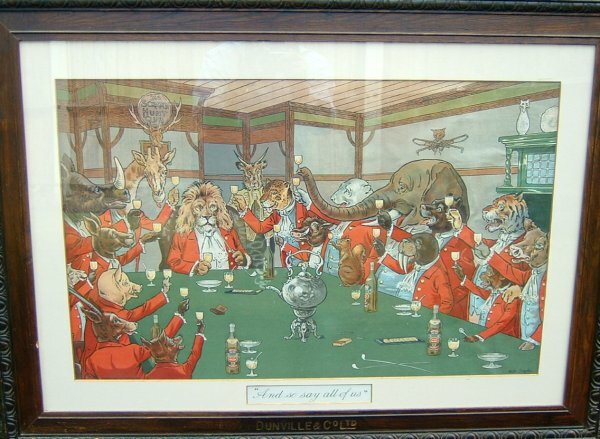 There is another print of 'Ye Scratch Hunt Club' with dogs dressed in hunting tunic drinking a toast to a bulldog at the head of the table, bottles of Dunville's Whisky on the table, and signed 'Parkes'. See a postcard of this print on the page of Dunville's Whisky Postcards. The inset pictures on the left poster are labelled, top left: 'Head Offices Arthur Street', top right: 'New Duty Paid & Bonded Stores Calender Street', lower left: 'Duty Paid and Bonded Stores Adelaide Street', lower right: 'Still House'. 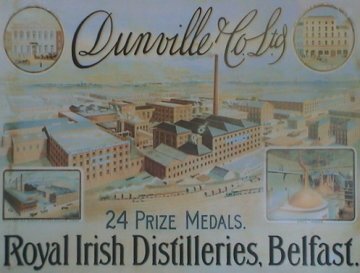 The signs in white lettering on blue backgrounds read: 'Royal Irish Distilleries', 'Dunville & Co. Distillers' (twice). Behind the tall chimney is the Distillery Football Club. Its sign reads 'Distillery Footba', with the 'll' hidden. The railway at the foot of the picture is labelled 'Great Northern Railway near Terminus Belfast'. All the vehicles in the pictures, other than the steam trains, are horse-drawn. 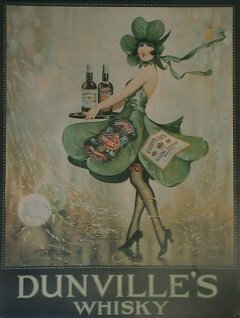 The whiskies carried by the waitress and advertised on her dress are Dunville's Special Liqueur Whisky and Dunville's VR Fine Old Whisky. This poster is signed by Edward Cole in the lower left corner and has the name 'Henry Hindesley Ltd. London' printed in the lower right corner. High quality copies of these posters may be obtained from www.oldirishposters.com On their website, under 'Browse Posters by Surname', select 'Dunville'. This is not a paid advertisement, but please mention that you saw these posters on the www.dumville.org website. 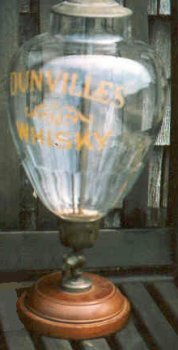 This Dunville's Whisky dispenser has been made into a lamp. On the back are the words 'T. Wallis & Co. Holborn Circus, EC' and separately 'Belfast'. The photograph was provided by John Hutchinson. The dispenser has been in his family for at least three generations and was made into a lamp by his mother or grandmother. The Head Offices in Arthur Street, shown in one of the inset pictures on the left poster, were built in 1906, and so that poster would have been printed in or after 1906. While the poster has the words '24 PRIZE MEDALS', the mirror at the top of the page has the words 'AWARDED 25 PRIZE MEDALS'. Therefore the mirror would have been made after the poster had been printed, i.e. after 1906.